Miranda Lambert is a well known country music artist from the USA. She was born in Longview Texas and she was influenced by her father who was a songwriter and guitarist. She grew up with a deep appreciation of the great legends of country music such as Guy Clark and Merle Haggard. She began her career when she was only 10 years old when she performed on the Johnnie High’s Country Music Revue, which is a variety show based in Arlington, Texas. This is the program which helped to highlight such stars as Lee An Womack and LeAnn Rimes and launch them to stardom. Miranda was inspired by her musician father and he taught her to play the guitar and to write songs. She began writing her own music as a teenager and started a band when she was 17 called “Texas Pride”. Her family was very supportive of her efforts, helping to finance her first recording. She rose to fame when she won third place on the 2003 season of Nashville Star. This led her to sign a contract with Epic Records and she later made her foray onto the music scene with her first single “Me and Charlie Talking”. Her first album, Kerosene went Platinum in the USA and four of the singles made it to the Top 40 Billboard Hot Country Songs chart. She started to become much better known after the album was released and she went on tour with some of the biggest names in the country music scene including Keith Urban and George Strait. Miranda Lambert recorded her second album with Columbia Records Nashville, which was released in 2007 and called Crazy Ex-Girlfriend. The song “Gunpowder & Lead” became her first Top 10 country hit in July of 2008. The songs “Famous in the Small Town” and “More Like Her” were also top 20 hits from the album. Lambert’s third album was released in 2009, entitled Revolution, and contained two more number one hits; “Heart Like Mine” and the touching ballad “The House That Built Me”. Her fourth and most recent album was released in 2011 and included another number 1 hit single, “Over You”. Lambert has been recognized for her musical talent by the Academy of Country Music Awards, The Grammy Awards and the Country Music Association Awards. Lambert has also formed a collaboration project with Angaleena Presley and Ashley Monroe in a side project known as ‘Pistol Annies’. The trio released an album entitled Hell on Heels in September of 2011. She has also been named one of the “Hottest Women of Country” by Maxim Magazine and one of the “Most Beautiful People” by People Magazine. Lambert married Blake Shelton, a fellow country singer, in 2011. She sang backup vocals on her country cover of the Michael Buble song “Home”. Lambert and Shelton also recorded a duet together called ‘Bare Skin Rug’. 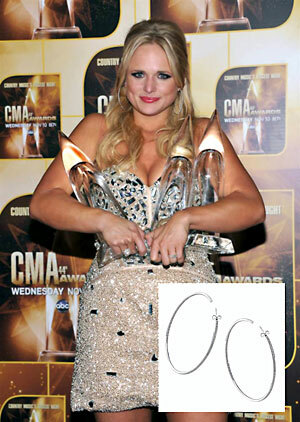 Miranda Lambert is pictured here wearing Diamond Inside Outside Hoop earrings by KC Designs.